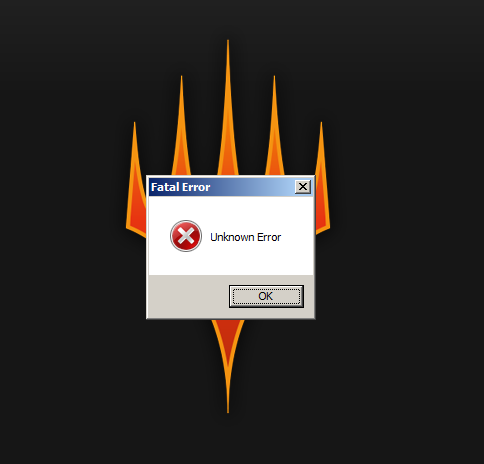 Fatal Error, you say? Like this game, perhaps? Someone at Wizards of the Coast must have been reading my blog, because a handful of weeks after I opined that Hearthstone made me want a new online Magic experience, they went right ahead and dropped a very weird bomb: The yearly Duels of the Planeswalkers games? They were going away. Now, that “franchise” was going to become the baseline for a bigger product [much as it should have been to begin with] that would allow Wizards to cater to the new Magic player by introducing sets of cards as they were released on paper to a digital client that was a little more friendly and not Magic: Online. And that, friends, is how you end up with a product that’s pushed out the door in a terrible state to players that really want it to work out, but who are going to quit, because – as it so often seems with Wizards – they don’t want to pay for quality. Stainless Games has a reputation, now, amongst Magic players as “a bunch of people who just don’t know what they’re doing” and their latest exploits with this new game just prove that to a T.
But even just getting past the launch issues [and some of them are still there, in fact, the server see-saws daily, finding games against human opponents seldom works, it’s…not a very good experience] there are other problems with this iteration of the Duels franchise. We’re 500 words into this review and I haven’t even told you what Magic is – that’s how terrible this situation is. So, Magic is a duel between two Wizards. They use their armies and spells to annihilate the other party. 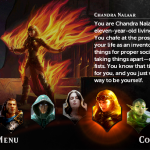 Each wizard – known in the series as a “Planeswalker” starts with twenty life and [for most formats] a sixty card deck. Decks can consist of magical creatures, spells, artifacts [this is a gross oversimplification] and – crucially lands. Lands power your magic. Magic comes in five flavours: blue, red, green, white and black. Each flavour has it’s own personality. Blue is thinky and slow, red is temperamental and fast. Black only cares for itself and uses the graveyard as a resource and so on. Magic is complex. Where a game of Hearthstone is all about getting creatures down and retaining control of the board, Magic can be far more subtle. Even if your opponent has a board full of guys, you can sometimes trick him and win. This complexity is great; it’s what makes Magic so tactical. But if the online experience is badly built, all that’s going to happen is that you’re going to be frustrated. And, unfortunately, that’s exactly what we have here. Getting cards is a grind because the game offers daily quests that are just plain frustrating. Get a quest to build a deck that’s an “archetype?” Great. That means you need to use the deck wizard [a wizard that suggests cards to include in your deck] to build a monstrosity that you somehow have to pilot to game winning situations. Want to go into versus battles to complete your quests? Good luck getting an opponent. 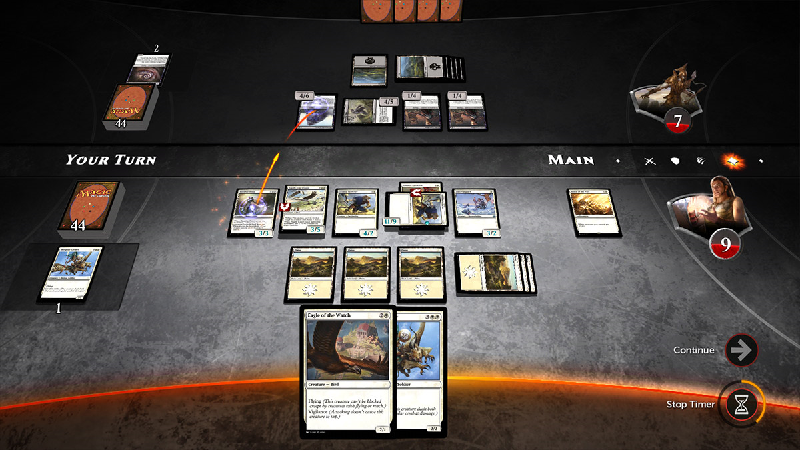 And even when you get an opponent, if you are winning the game and they concede, you…now have to beat the AI. And let’s say you do decide to build your own deck, well, good luck. The game comes with a handful of filters [that are about as baseline as it gets] that allow you to do the job. There’s no card/ability keyword search. There’s no filter that lets you see only cards from a given set. 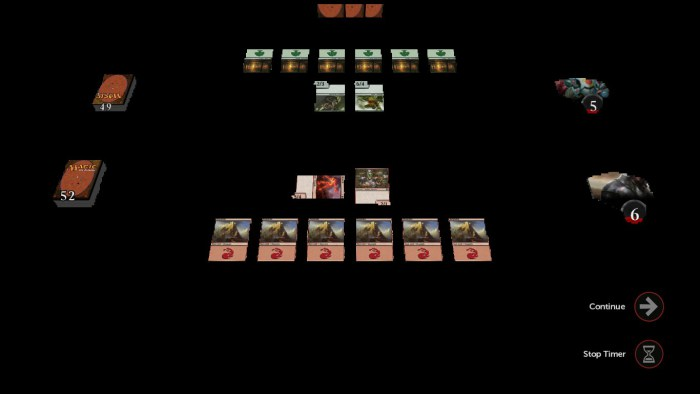 While you can see the number of cards in a colour that you’ve added to your deck, there’s no good visual way to see what’s going on. Oh, and while we’re talking about that, let’s talk about the restrictions Duels players face when building a deck. 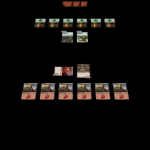 Wizards has said that Duels players won’t get “all of a set.” This means that if there’s 100 cards in a set, Duels players might only see eighty of those. Then, on top of that, there are rarity restrictions: The game will literally only let you own one copy of a mythic rarity card and you can only put that one copy [but you’re allowed multiple mythics with different names, of course] into your decks. So, it’s not even remotely like paper Magic at all [It’s been a long time since Standard – the format most people play – has had a banned or restricted list. Usually, you can just walk in playing a deck with four copies of whatever your heart desires.] – it’s just terrible. And if you happen to be grinding, good luck again: there’s a cap of 400 coins per day that you can earn. [Stainless has gone on record that “a day” starts at 12:00am. But the community has figured out that this is not the case. 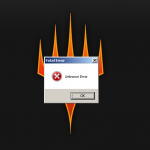 “A day” – right now, anyway – starts whenever you originally started the client for the first time [or whenever you let your daily lapse and pick up the game again, I think.] – so if you started playing at 03:45 on the 30th of July, which was a Thursday, then your next quest will be given to you at 3:45 on July the 31st. This cap, by the by, was something that Wizards promised – right up until launch – wasn’t going to be in the game at all. But wait! You’ve heard two headed giant is back! That’s awesome, right! Wrong. Stainless has somehow messed this up, too. That bad code that made you not find opponents in one-versus-one? It’s here, too, but worse! Now, you might get paired up with your buddy, [if you went in with a buddy, of course] but you’re probably more likely to be opposing your buddy. And should you somehow get matched together [a Christmas miracle!] you can’t communicate within the client AT ALL. You have to know the other person’s steam account and use the Steam overlay to talk to them. Which, of course, obscures the game window entirely. Two Headed Giant is a great format where you and a friend are “A giant” and share a life total. When it’s “your turn” then you play cards together, as one on your side of the board, declaring attackers and blockers and so on. It’s a fantastic format, because – say – between the pair of you, you might be running all out aggro and he might be running good control and that way, you can keep the tempo of the game flowing while denying your opponent their most crucial plays. But because two headed giant is a “Casual” format and not [really] endorsed by Wizards of the Coast, Stainless has decided that players who participate in these duels…don’t earn currency. That’s right. A game of Magic that often takes longer, often has more intricate plays and that often requires dedicated deck-building has NO PRIZE SUPPORT in this particular duels client, making it fundamentally pointless. Players need to either: choose to earn currency or play for nothing/fun. And you know players, right? If they’re there for a couple of hours and it’s a choice between gaining currency or playing for fun, they’re going to play for currency because it gets them ahead. I haven’t even mentioned how buggy Duels is, yet and we’re almost at two thousand words. Some people can’t even start the game. Or if they start it, it results in a black screen of nothingness. Or if they get a little further than that, still, they might end up with visual stew. And should you actually – after all this – be interested in the game, be VERY wary. 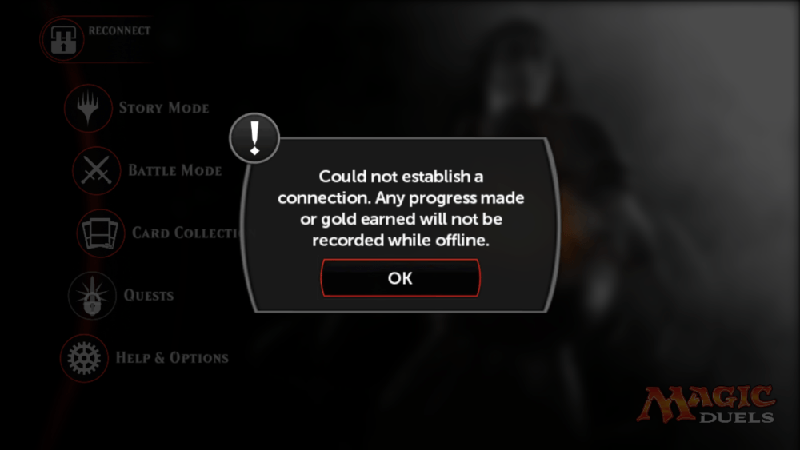 The platform you start playing on is the platform you’re essentially locked to. Did you get the Xbox One version of the game, but you’re not crazy about how it works with a controller, [I haven’t even mentioned that – I hated the way the controller worked with the PC version] well, if you pick the game up on Steam, you have to start ALL OVER AGAIN because there’s no cross-platform support built into the game at all. It’s ludicrous. Oh. And lest I forget, there’s no Android release in sight [ever, possibly] and it only runs on the very latest iOS devices. Let’s not forget that the PS4 version isn’t even out yet. If you do get into it, be aware that you’re going to be trapped in a tutorial mission [I dunno if they’ve done away with this yet] that explains EVERYTHING about the game. The plus side? You get coins for doing all of this. The minus side? If you’re intimately familiar with Magic, you lose two hours of your life you’re never getting back. 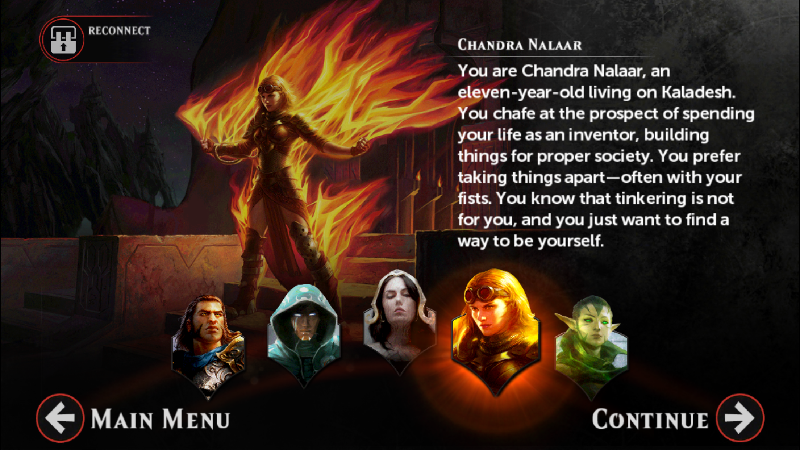 Oh, Chandra, I’d love to burn all the things, but my deck is terrible. Speaking of those solo story missions: if the idea here was to show the rise of these Planeswalkers – to show how they became more powerful over time then Stainless has a lot of work to do on those missions. The way these story missions play out: you start off as a weakling with a weak deck and – as you progress through the story, the opponents get more difficult and your deck gets upgraded, but it’s still, basically, a weak deck. There’s no sense of growing power at all. Just more spells that mean nothing added to your pile that you somehow have to pilot to victory. 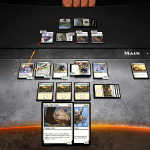 The black Planeswalker gets cards that come into play tapped. The blue planeswalker gets cards that – when targeted – just plain die. The red planeswalker gets miniscule guys that have to deal with huge threats, somehow. You get the point. 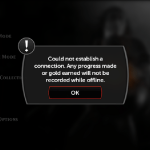 I lost four or five hours of my life in the black campaign, just because I kept drawing dross and could not stem the tide of the AI’s superior decks. Imagine a novice player playing those matches? Imagine being beat up over and over and over again and not realizing that it isn’t you, it’s the card choices that were made for you? What would you do? You’d put the game down and never return. Wizards doesn’t need that. Can I say anything good about this game? I can say some snarky things: The menu system is awesome! [Actually, it really isn’t bad at all] – the art for the little interstitials is great! [But the reward animations that play whenever you successfully beat a campaign are laughably bad.] And that’s about it. When I said in my Hearthstone review that I wanted a decent Magic client, what I meant was that I wanted a GOOD Magic client that wasn’t Magic: Online [which has it’s own particular set of frustrations] that would be able to contend with Hearthstone. This isn’t that game. If you’re curious, my best advice would be to treat this as a /very/ long term beta. Just know that you’ll be grinding your teeth all the way through – and what you might end up with – after the “beta” phase is over will probably not even touch the greatness of the Microprose game from 1997. It’s sad, really. Wizards could have tied this market up completely, but instead, they just don’t seem to care.